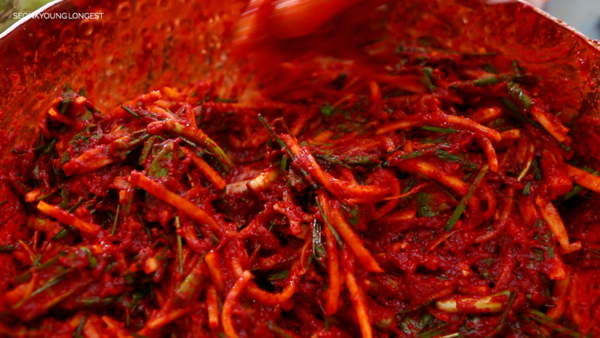 Mak Kimchi is same flavor as traditional kimchi but with chopped cabbage. So it’s easier and faster to make. 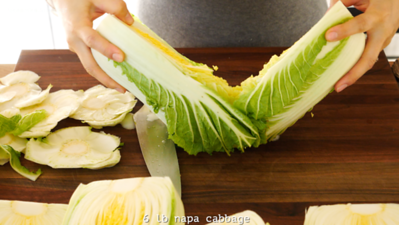 Cut the cabbage into quarter in lengthwise and remove the core. Cut the leaves into bite sizes. 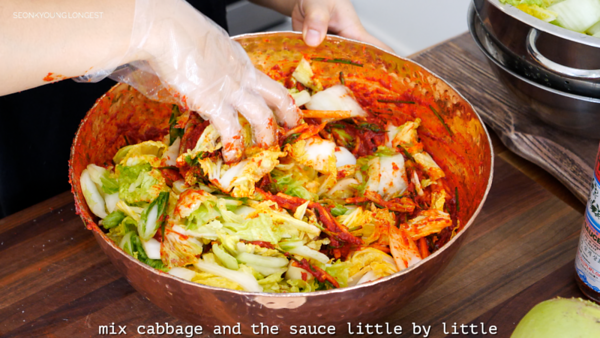 Sprinkle Korean kimchi salt (it’s coarse sea salt) evenly to all of the cabbage layer by layer. Splash 3 cups of water at the end. 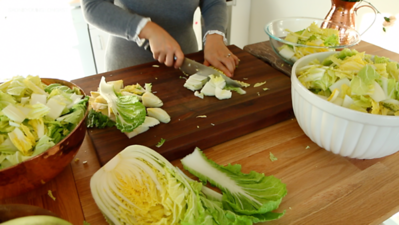 Salt down cabbage for 7 to 9 hours if it’s 60 degrees and below (fall/winter time), 4 to 5 hours if it’s 60 degrees and high (summer time). 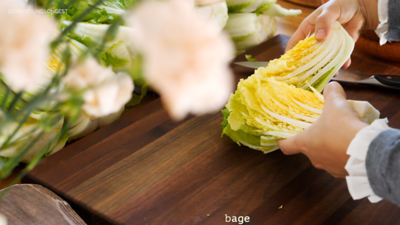 Rotate the cabbage once or twice of the salting process. Rinse at least 3 times through in cold water and place in a large strainer. Drain completely, about 1 hour. 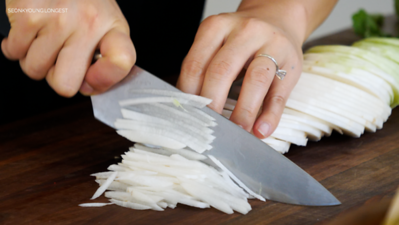 Meanwhile, let’s make kimchi paste and prepare vegetables. 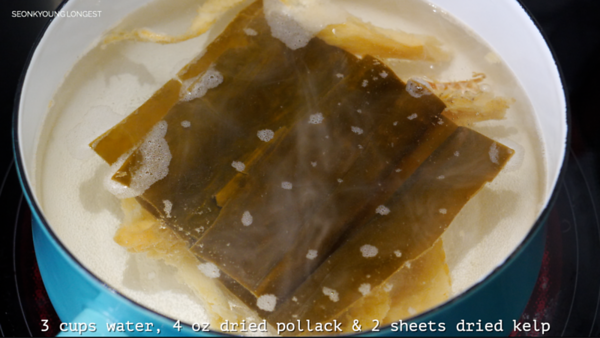 In a sauce pan, add 3 cups water, dried pollack and dried kelp. bring it to boil over high heat, reduce the heat to medium and simmer for 10 minutes. Remove from the heat and remove all the solid ingredients. 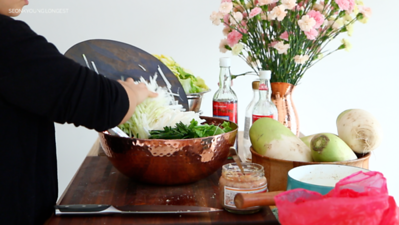 Add sweet rice flour and whisk. Return to the heat and bring its to soft boil over medium high heat. Keep whisking and cook for 2 minutes. Remove from the heat and let it cool. 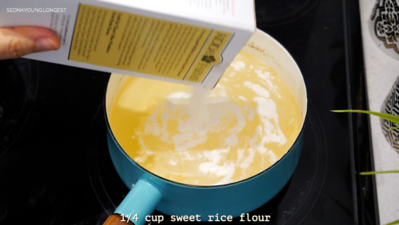 This is the sweet rice flour I use. I also use this one to make mochi! 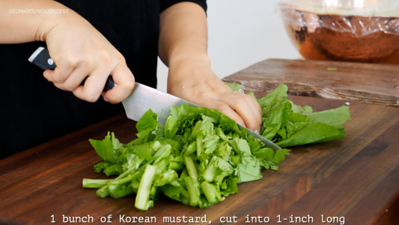 Cut Korean radish, chive, mustard leaves and green onions into 1-inch long pieces. 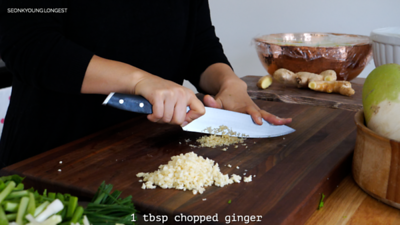 Chop garlic and ginger finely. 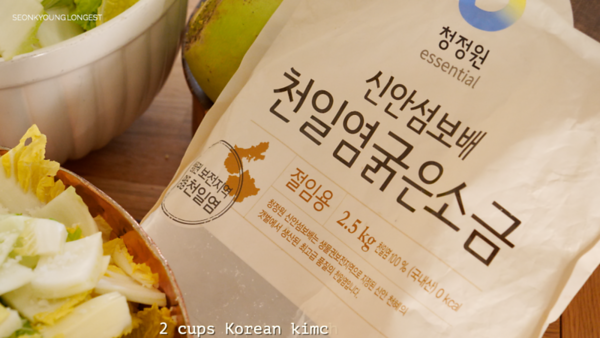 In a large mixing bowl, combine the sweet rice porridge, gochugaru, fish sauce, saewoojeot, maesilaeg, sugar and salt. This is Maesilaeg, Korean plum extract. There is cheaper one out there, but it is too sweet- not much different than using sugar. The one I’m using is a bit pricy, but definitely well made and great product! You can find better price point at Korean market. 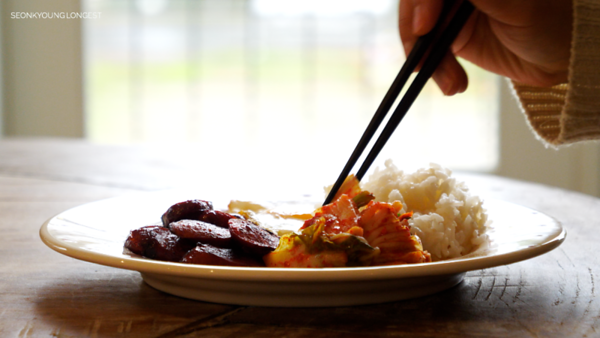 In Korea, maesilaeg is something “real good cook”‘s secret. 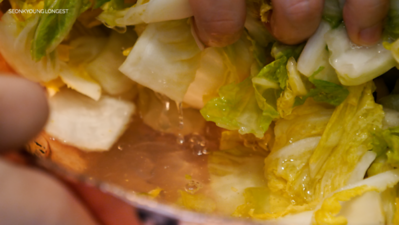 Now, toss the salted and drained cabbage and mix well until everything is evenly combined. 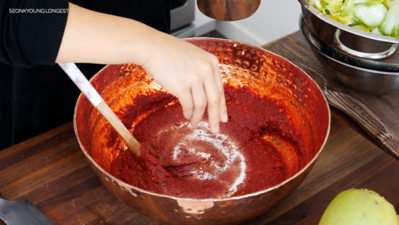 If your mixing bowl is not big enough, just do half or quarter at a time. 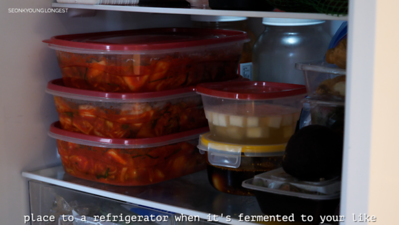 Transfer to a air tight container (Make sure to give container about 1 inch room, because when kimchi is fermenting it will bubble and expend). Close tightly and place on your kitchen counter for 1 to 3 days, depending on your taste then place in a refrigerator. I like to leave 2 days (48 hours). 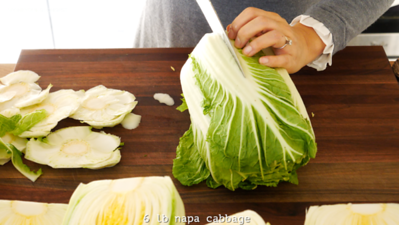 Sprinkle salt evenly to all of the cabbage layer by layer. Splash 3 cups of water at the end. 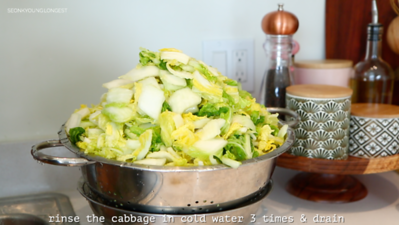 Salt down cabbage for 7 to 9 hours if it’s 60 degrees and below (fall/winter time), 4 to 5 hours if it’s 60 degrees and high (summer time). 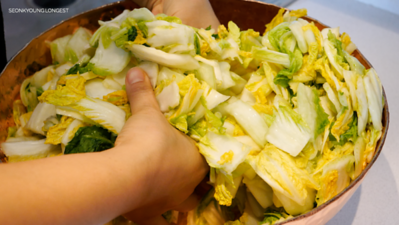 Rotate the cabbage once or twice of the salting process. 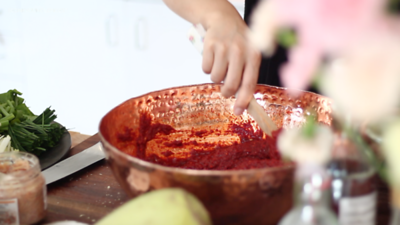 Meanwhile, let’s make kimchi paste. In a sauce pan, add 3 cups water, dried pollack and dried kelp. bring it to boil over high heat, reduce the heat to medium and simmer for 10 minutes. 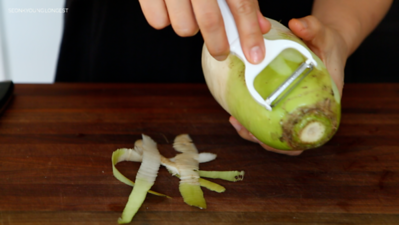 Remove from the heat and remove all the solid ingredients. 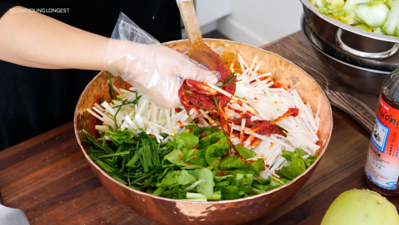 Transfer to a air tight container (Make sure to give container about 1 inch room, because when kimchi is fermenting it will bubble and expend). 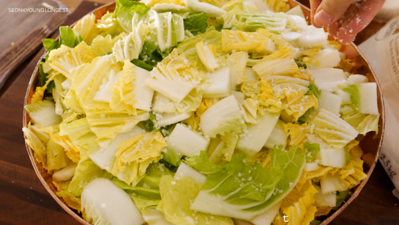 Close tightly and place on your kitchen counter for 1 to 3 days, depending on your taste then place in a refrigerator. I like to leave 2 days (48 hours). Enjoy! 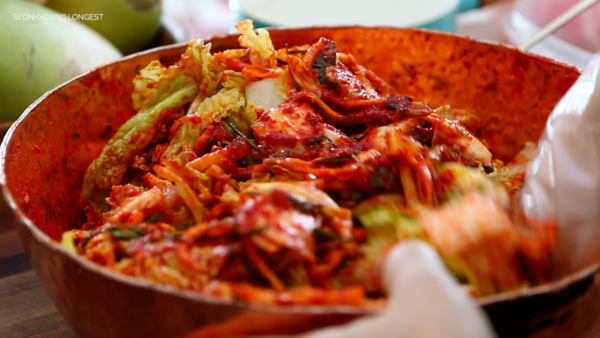 I’m making this recipe of kimchi right now. Your video said 2 cups of salt but your written recipe said 3 cups. 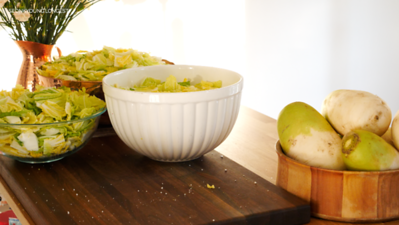 I salted my cabbages with 3 cups of salt and they turned out to be extremely salty and super soft. Are you sure the measurement is correct? This looks amazing. Just discovered you thru YouTube. 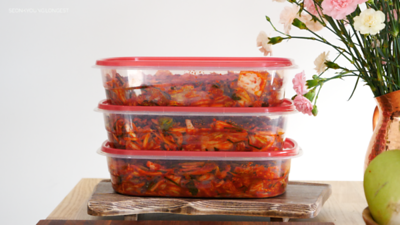 I agree…mak kimchi is just easier in every way! Going to make now. Thank you so much for sharing your recipe. I can tell you’re a good cook 😋👏. I made this! 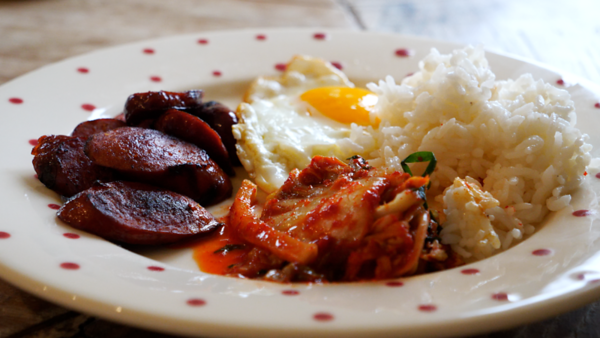 The kimchi was spicy and a bit salty but very good. 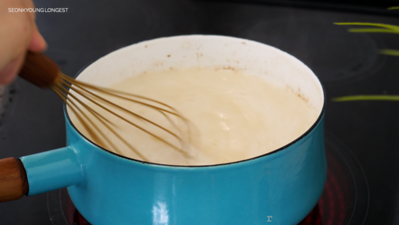 I noticed when I was making it that my sweet rice porridge was very thick. Any tips for the next time I make it? DOM, I have the same issue with saltiness. 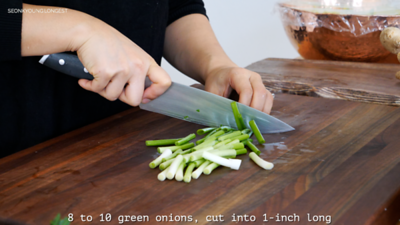 I think it comes from chopping the cabbage first. It must allow the salt to penetrate the cell walls of the cabbage, and holding it. Even after the 3 thorough rinses, still too salty. !/2 a day and $20 gone bye bye!